A pregnant woman, a male passenger and two children were taken to the hospital Sunday afternoon after a serious two-car head-on collision in Pierce County, according to Washington State Patrol. The incident occurred on northbound 167 near 31st Ave. The cause of the crash is not yet known. The pregnant woman driving one of the vehicles, a 3-year-old girl and 6-year-old boy all did not suffer serious injuries. Washington State Patrol said the children had just scrapes and lacerations. The man in the front passenger seat was taken to the hospital for an aortic injury. The driver of the other car was also pregnant. She refused aid, WSP said. Police said all five people involved in the crash – including both pregnant women – were not wearing seat belts. While seat belts may seem like a hassle, they have proven time and time again that they save lives. As vehicles become smarter and safer, a simple seat belt – which have been around since the 19th century and standard in the United States since the 1950s – is still the best way to prevent serious injuries in an accident. Washington State takes seat belt safety very serious; it is one of many states to have a primary seat belt law on the books. A primary law -- unlike a secondary law -- gives police the right to ticket a driver for not wearing a seat belt even if no other driving offense has occurred. Washington State requires anyone older than 8 years old or taller than 4-foot-9 to wear a seat belt. If a child is younger than 8 or smaller than 4-9, they aren’t exempt from these laws. The Evergreen State has strict car seat requirements. The penalty for not buckling up? A $124 maximum fine for the driver, no matter where in the car (front or back) the violator was sitting. Washington is one of the 14 states with a law that requires children under the age of 13 to ride in the back seat. Want to know how dangerous it is to not wear a seat belt? According to the Centers for Disease Control, more than half of teens and adults who died in crashes in 2015 were unrestrained. The CDC estimates that seat belts saved almost 14,000 lives in 2015. 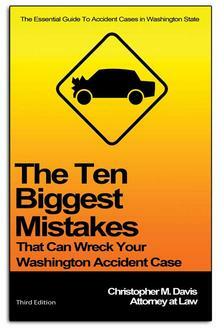 In Washington State, 109 of the 326 passenger vehicle fatalities involved an unrestrained person (age 5 and above). The National Highway Traffic Safety Administration says seat belts saved 232 lives in Washington State in 2016. Injured In A Car Accident In Washington State? If you have been injured in a car accident or any other type of traffic collision, contact Davis Law Group, P.S., for clear answers about your rights, your potential case, and your best options for recovery. For over 20 years, attorney Chris Davis has been committed to protecting the rights of injured people and helping them financially recover so they can reclaim their lives and focus on their future. Call the award-winning personal injury lawyers at Davis Law Group at (206) 727-4000, use the chat feature below or fill out the contact form on this page to set up a free, no obligations initial case evaluation.